Sparse turnout on Day 2 of hearing on “Ghost Project Plan”; Jeffries, Kruger testify; open mike night for BUILD, unions. Please note that we have been substantially updating that July 29, 2009 post’s account of the first day of the hearing and will be doing so further. 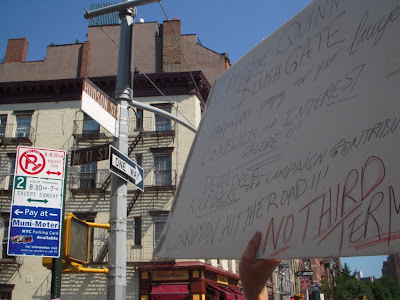 So if you if you haven’t yet read the latest additions about Kathy Wylde, the president of the Partnership for New York City, and our conversation with Bertha Lewis about the affordable housing units that ACORN did NOT negotiate for, you may want to read through to the latest additions at the end of that July 29 post to find the updates. Here is a list (from which we read) of the very sweet “cookies” Mr. Ratner has been trying to get out of the public cookie jar when we delivered our testimony. As you can see from the video posted in the Atlantic Yards Report account, with only three minutes to testify we were only able to get to number 11 on the list.- The list goes to 24 but can easily be added to (contribute more in the comments section if you wish). 1. The right to 22 acres without a competitive bid. 2. An exclusive monopoly by a single developer over the ownership and development of more than 30 contiguous acres of central Brooklyn. 3. Eminent domain abuse and windfall profit from that abuse. 5. A lower capacity railyard for the MTA and Long Island Rail Road that will not allow for needed flexibility or provide future expansion and growth. 6. 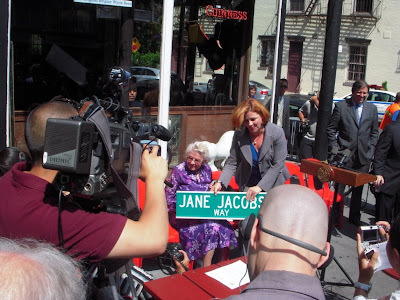 Seizure of public streets, sidewalks and avenues. 7. Sidestepping proper process and ULURP. 8. Override of local zoning. 9. Bait-and-switch promotion with value engineering to save the developer money without benefitting the public. 10. Outrageously bad design and superblocking. 11. No real commitment to provide affordable housing. As we discussed with Betha Lewis of ACORN the first day of the ESDC hearings at which we were giving our testimony, anyone who earns an annual income from $38,407 to $46,086 (HUD family of four standard) is not going to be provided with affordable housing. Coming into the hearing we asked some of the demonstrators demonstrating in favor of the project whether they had incomes in that range. They said their incomes were lower, in which case ACORN did not negotiate to have any affordable units included in the project for them because the lower income units would be provided by the federal tax code in any event. Then skipping over the units ($38,407 to $46,086) that are not being provided, one finds that one is dealing with units that are renting for $3,000 a month, $2,300 a month, $1,500 a month: Units that the market would be providing anyway. In other words, ACORN basically negotiated that Forest City Ratner would provide absolutely nothing in terms of affordable housing. 12. A special exemption from the Section 421-a Real Property tax law so that the developer can escape paying real estate taxes without providing to the public the same level of affordable housing that other developers would have to provide to get benefits under that law. 13. $2-$3 Billion in no-bid taxpayer subsidies. 14. A special tax loophole to finance private arena which loophole was unconscionably shilled for in Washington by the city and state officials. 15. Preferential treatment for a developer despite risk to the public associated with the developer’s extreme financial weakness. 16. Sight-unseen approval of the project by the ESDC board without first letting the public know what the project will be. 17. The developer has been allowed to have a five year period go by during which it has not had to produce a design for an arena it actually intends to build. And all that time the project is allowed to continue despite there being no approval in place for an arena actually intended to be built. This entire five year period has gone by without the public agencies actually having any concrete or written deal with the developer. 18. City manipulation of real property tax assessments creating the risk and substantial likelihood that tax ex-exempt bonds issued to fund the arena could be declared taxable. 19. Three decades for the developer to complete the project (while creating blight and parking lots in the meantime). 20. Proceeding without a real, true and accurate cost benefit analysis or even a reasonable pretense of one. 21. Proceeding only with a portion of the project which the city Independent Budget Office projects will be a net loss for the city when the are no plans with respect to proceeding with the rest of the project. 22. Destruction of historic and worthwhile buildings in order to twist the public’s arm for support for “something” to be built and in order for the developer to amass extra windfalls of density. 23. Garishly oppressive design in the middle of brownstone neighborhoods as epitomized by giving the developer permission to have a fifteen-story illuminated and animated billboard towering over neighboring streets and buildings. 24. Giving the developer the right to privately collect all the proceeds from the right to name public places: The developer will receive $20 million a year for 20 years ($400 million in all) for the right to name what is supposedly a publicly owned arena after Britain’s Barclays bank. In addition, piling it on, the news recently came out that the developer will now also be given another asset that ought to be similarly valued, the right to name two city subway stations (and to have the NYC subway map redesigned) to feature name of that British bank in the station names, yet the developer will only have to pay 1% to the public/MTA of the annual $20 million amount it is getting from the bank for naming rights. 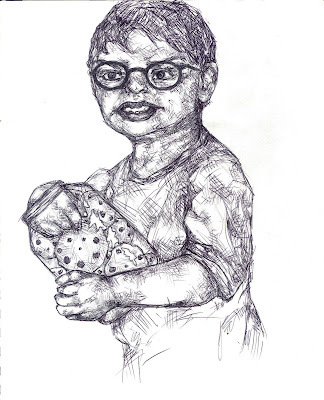 The fable about the little boy and the cookie jar is premised on the idea that it would be acceptable if the little boy got one or two cookies out of the cookie jar and that it is really only the inordinate quantity that the greedy little boy wants to get that is the problem. In our retelling of this story as a fable about Ratner’s outsized greed it should be noted that it would be inappropriate for Ratner to get even one of the above listed “sweet deals” out of the public cookie jar. Not even one of them taken singly is fair to the public or the kind of thing that ought to be allowed. Even so, our politicians do not protect us adequately and are often apt to let all sorts of favoritism pass. We have too often seen that kind of indefensible tolerance of things adverse to the public interest before. If Ratner had pursued only a few of his outrageous requests he would probably have a project unstoppably in hand by now and likely underway a while ago. Instead, he has thwarted himself and this is as it ought to be. This mega-project should be allowed to die and it should be remembered that it died because of Ratner’s outsized little-boy greed. We were at the first day of the Empire State Development Corporation hearings today on the new version of Atlantic Yards which is proposed to be approved sight-unseen by the public and the ESDC board. We testified and took the opportunity to ask questions of those who were there. There were also press conferences that went on, the most important being the really big one protesting the project before the hearing which was well attended by elected officials and candidates. In this post we will first provide you with our testimony and then we will tell you the about some of the questions we asked of other attendees. Answered or not, we got some interesting insights. Here is our Noticing New York testimony which we read almost entirely to the end of before our three minutes for oral testimony concluded. We handed in a written copy with attachments. It is probably best read on the web though to take advantage of the hyperlinks. 1. There is good development and there is bad development. 2. Good development begets and whets the appetite for more development. Bad development creates enemies and stagnation. Good development moves relatively fast, providing jobs in the here and now rather than in the hereafter (after many of those now looking for jobs will have moved on to other things). For instance, if the alternative UNITY plan had been adopted there would be a lot of people working right now and a lot of people housed and about to be housed. 3. Good development finds a quicker more ready acceptance by the community, works with its values and doesn’t needlessly destroy its landmarks and worthwhile buildings. 4. Good development doesn’t go out of its way to embrace monopolistic ownership and control of huge swaths of the city by a single developer abusing eminent domain. 5. Good development doesn’t clog the natural forces of the economy and displace better competing alternatives. 6. Atlantic Yards is NOT good development. 7. The Atlantic Yards plan and design (such as we have actually been allowed to know what it may now be) proclaims by its obvious inappropriateness that it is a sponge for subsidy and benefit for a single developer at the expense of the public: its overbearing density through zoning overrides, the seizure of public streets, sidewalks and avenues, the suspiciously irregular footprint taking extra land through eminent domain abuse. a. No identification at this time of the supposed benefit of the megadevelopment. Benefit will be determined on an “as-you-go” basis: The project will start with the arena which the city’s Independent Budget Office has determined to be a net loss for the public. b. Approval of (and these public hearings for) a sight-unseen project where nothing is yet designed (after half a decade! ), not even the arena, and where an architect has not even been selected for the rest of what is being approved. The only promise is that it will all be “value-engineered,” i.e. built cheaply so as to cost the developer as little as possible. c. Refusal to identify the total amount of subsidy that the megadevelopment will be given. Since ESDC is withholding or says it doesn’t know the amount, we offer our own calculations that total public subsidy being diverted into the project will surely exceed $2 billion and may well approach $3 billion. d. No credible enforcement of or holding the developer to specific terms. ESDC has fashioned contract remedies that don’t kick in for 25 years and this hearing is held specifically because ESDC has just recently rewritten the deal, tilting it hundreds of millions of extra dollars more in the developer’s favor without any quid pro quo. e. A no-bid award of a megadevelopment to a single developer on what is essentially a long-term, low-cost option basis. The breaking up of the project into optional (and assignable) segments undermines the specious pretexts that have been given for favoring the blank check to this developer over the Battery Park City model of bidding out to multiple developers. 9. In the end, the lopsided unparametered monopoly that has been “negotiated” by ESDC (“negotiated” is hardly a credible verb in this context) affords the government no leverage to insist that Forest City Ratner provide any level of public benefit in exchange for all the public giveaways by virtue of the blank check it has been allowed to write for itself. The hearing and the press conference and rally preceding it was well attended by political officer holders and candidates, including two candidates for mayor, Tony Avella and Billy T. (Billy Talen, better known as the Reverend Billy), the vast majority most of whom were speaking in opposition. The hearings are being held over two days but we didn’t see the other Billy T. candidate for mayor, Comptroller Bill Thompson, who has at least made some noise about changing the way City Hall puts the interest of connected real estate developers above the public. We’ll see how Thompson handles the opportunity of these hearings, including whether he shows up at the hearings tomorrow, which are likely to be less well attended. Bill de Blasio was in the news this week winning a fight to stay on the ballot despite a typo in the fillig of his petitions. We were looking for de Blasio, who called for "a moratorium on demolition until there is a written plan" that "confirms what will be built when and confirms affordability" and that he "can't support" an arena-only plan (before the project actually deteriorated to the extent that it now has) because it seems that we are going to have to count on the new public advocate as a critical line of defense against boondoggle mega-projects like Atlantic Yards. We are looking for candidates that will have their heart in the job. I have many serious concerns about the Ratner plan as it is currently proposed. I especially have concerns regarding the proposed density of the development and the resulting strain that this density will put on the area's infrastructure, e.g. traffic, public transportation, and public school capacity. In addition, I am against the use of eminent domain unless in the case of overriding public benefit resulting from that use*. Second, when we ran into Mr. Levin Friday morning at Teresa’s on Montague Street (a favored location for “power breakfasts”) we asked him about his attending the hearing and he wasn’t clear that he would make it: He spoke about the number of doors he is needing to knock on these days. This notwithstanding, Mr. Levin spoke critically about the way the project had degenerated since his above statement, together with the new $100+ million package of giveaways with which the MTA recently sweetened the developer’s deal. (We are supposed to be following up with Mr. Levin to interview him more thoroughly on his positions, something he mentioned Friday morning that we might convert to an e-mail chore.) It looked as if nearly all of Mr. Levin's opposing candidates in the race for the 33rd were there for the press conference. We'll see if Mr. Levin shows up tomorrow. Whapped Up Side of the Head: BAM! One of the early testifiers in favor of the project was the heavily-hissed Alan H. Fishman, Chairman of the Brooklyn Academy of Music. The reasons he said that BAM was supporting the megadevelopment sounded to our urban planner’s ears rather like an urban planning analysis of why Atlantic Yards might constitute a constructive overhaul of the Fort Greene and Prospect Heights neighborhoods in which Atlantic Yards is to be plopped. 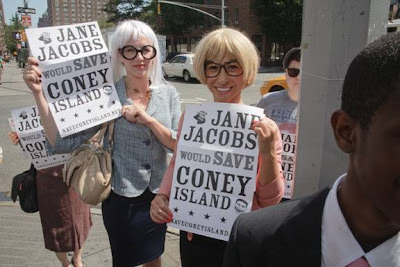 Frankly it didn’t sound like a good analysis to us and it reminded us of how the Brooklyn Museum went off track and betrayed the Brooklyn Community by “honoring” Bruce Ratner while he was trying to sell the city and sate on the idea of giving him more subsidies. It also seemed a dicey PR move for BAM to be taking a position that is likely to sincerely bother many of its informed and educated patrons. Isn’t this the kind of thing that people cancel subscriptions over? We caught up with Mr. Fishman just outside of the door noting that it was the second time we had heard BAM giving public comment in support of the megadevelopment. Mr. Fishman said that it was the first time we had heard him deliver these comments (it was somebody else before). We noted what had been yelled out in the room as Mr. Fishman departed the lectern, that developer Bruce Ratner was on the board of BAM. Yes, said Mr. Fishman, Bruce even used to be chairman of the board some time ago. So the taking of this position by BAM was handled at the executive level without board authorization we asked? Yes, Mr. Fishman told us. 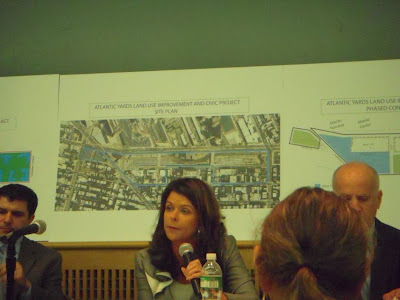 It is an interesting impulse to want to set process aside, we told Mr. Fishman, precisely because it is the setting aside of process that has given Atlantic Yards its shape.- We hadn’t yet testified but this was one of the things we had already written into the testimony we had prepared.- Because Atlantic Yards is a developer-initiated, developer-driven project its whole design reflects the fact that it is designed and tailored to soak up subsidy and benefit for the developer by diverting public resources. Mr. Fishman suggested that was a separate issue. We said that to us the project clearly looks like something designed to benefit a developer and not the public. Mr. Fishman said that might be true. In other words, we told Mr. Fishman that the project is not only a very bad project but how bad it is cannot be separated from the way in which process was set aside. (One lesson that Atlantic Yards certainly raises starkly is that when one sets process and procedure aside, you had better get a good result rather than striking out on both counts. Obviously, Atlantic Yards is especially problematic because of its simultaneous failure.) Mr. Fishman said he disagreed with us that the project was a bad project. We suggested to Mr. Fishman that in his BAM capacity he needed to be speaking from the standpoint of a 501(c)(3) community betterment point of view and that he should be expressing what wold be good for the community from the community’s standpoint and not from the developer’s standpoint. We were out of the main hall talking with Mr. Fishman when Borough President Marty Markowitz, who never met an Atlantic Yards developer-request or public-shortchanging he didn’t endorse, spoke to predictably mixed reactions. His spiel was standard Marty AY stuff: “Since the very first Atlantic Yards conversation took place my opinion has not changed. I still believe that this is a project that will benefit . . . etc.” Markowitz has not faltered no matter how much the project has changed and no matter how much more in giveaways have been piled on. No matter. Nothing has ever caused Mr. Markowitz to have even the slightest criticism of the project from whose developer he takes substantial money. The only possible slacking we might note is that Markowtiz did not send out a laudatory Atlantic Yards press release yesterday although Markowitz did send out a laudatory press release yesterday when the City Council voted to approve an incompetent or insincere rezoning plan that will terminate Coney Island’s history as an amusement area. We left off, saying to Mr. Maisel, “So you are a public official and you can’t identify any boondoggles, any misspending of public money?” The assemblyman excused himself to exit the hall and then several minutes later quietly came back in the other door to sit at the back. We wonder, do Mr. Maisel’s constituents know how many billions in taxpayers dollars are being spent on a no-bid basis to enrich developer Bruce Ratner? We were sitting with one of our former colleagues from the state finance agencies (who also testified against the project) when she pointed out that Kathy Wylde, the president of the Partnership for New York City, was present sitting near the front. Open-mindedly our colleague entertained the idea that Kathy might be testifying against the project as we both were. Everyone at my former agencies tended to be pretty aware of Kathy and we certainly all knew she was far and away bright enough to know what’s what and have good judgment. We explained to our colleague that Kathy had already testified in favor of the project at two other hearings we had attended. We mentioned the piece Norman Oder had written about Kathy’s testimony before the MTA Finance Committee and mine following, that dealt with the way the Partnership’s support for the project was “evolving” to support the project even as it degenerated. 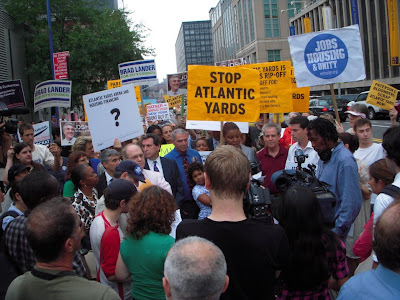 (See: Tuesday, June 30, 2009, The Partnership for New York City's evolving (and misleading) support for Atlantic Yards.) 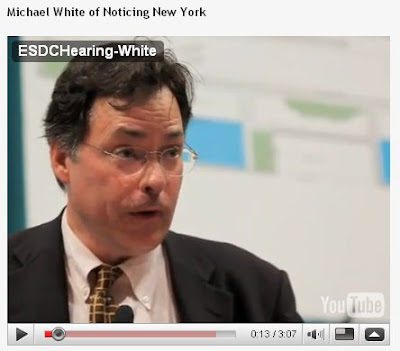 Mr. Oder's piece has video of the testimony we both gave. We also mentioned that Ms Wylde was in favor of eminent domain (“eminent domain abuse” we corrected ourselves- We all are in favor of eminent domain.) and the article we had written about this: Monday, July 6, 2009, Wylde Ideas, Making For a Wrong Partnership. We commented that we didn’t think that support for these bad ideas had been Rockefeller’s aspiration when the Partnership was set up. Ms. Wylde got up heading to the back of the room and so did we so we could talk to her. Something was up. It turned out to be a press conference by the project supporters driven inside by the rain. Before the press conference Ms. Wylde needed to confer privately with Senator Marty Golden. We asked Ms. Wylde whether she was there to testify or would be submitting something in writing. She said she wold be testifying personally. That did not come to pass. Later on we were there when Ms. Wylde’s name was called by the hearing officer but Ms. Wylde had departed. We asked Ms. Wylde about information that had not been made available by Forest City Ratner or ESDC at the informational meeting that previous week: “Do you know how much subsidy is going into the project?” She seemed to regard us askance. “I know as much about the project as you do,” she said. “No, seriously,” we said, “Do you know how much public subsidy is going into the project?” Ms. Wylde repeated herself, “I know as much about the project as you do." We asked Mr. Ulrich the same question we’d asked Assemblyman Alan Maisel: What did he think was the biggest boondoggle project in the city. He looked quizzical and asked about why were asking the question. We explained that it seemed to be an essential question to ask politicians because wasn’t it the job of politicians to recognize the misspending of public money? That seemed to make sense to him so we asked again. He thought for a moment, smiled and said “Certainly not this one.” “So you have a candidate for a project that is a bigger boondoggle?” we asked. “As a point of reference, what is it and what makes it a bigger boondoggle?” Mr. Ulrich didn’t have a project to name. We asked Mr. Ulrich whether he knew how much subsidy was going into the Atlantic Yards project. Kathy Wylde was standing right beside us in the crowded room and uncomfortable with our asking the question we had just asked her, wincing a little. 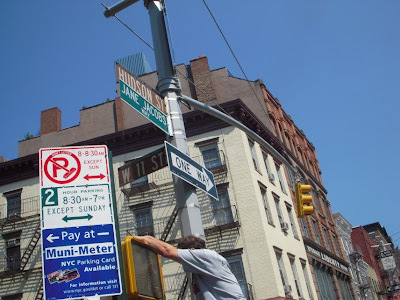 Though we asked more than once Mr. Ulrich had no answer and apparently did not know how much public money was being plowed into Atlantic Yards. Earlier we wondered whether Mr. Maisel’s constituents know how many billions in taxpayers dollars are being spent on a no-bid basis to enrich developer Bruce Ratner so to be fair we must also wonder whether Mr. Ulrich’s constituents happen to know this. While we are in the process of such wondering, we should wonder about the constituents of Marty Golden. 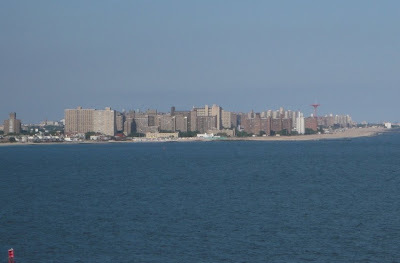 Golden’s Senate District overlaps a bit with Mr. Maisel’s, also including Marine Park on Jamaica Bay but it sweeps more east over to Bay Ridge, Dyker Heights and Bensonhurst. 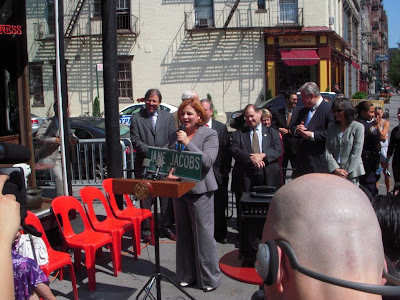 Mostly we didn’t see elected representatives from around the project assembling for this press conference except for Delia Hunley-Adossa, the challenger to quintessential Atlantic Yards opponent council member Tish James from the 38th Council District. Delia Hunley-Adossa’s campaign is apparently funded by Forest City Ratner by way of not for profits set up to support Ratner. (See: Friday, March 27, 2009, Behind Hunley-Adossa's campaign, treasurer Nimmons heads another dubious nonprofit, with Ratner funding.) By contrast, at the rally and press conference in opposition to the megadevelopment the candidates and politicians from the area around the project, the 33rd, 39th and 38th Council Districts were copiously present. Later on that afternoon we were able to ask Ms. Hunley-Adossa if she knew how much public subsidy was supposed to be spent on Atlantis Yards. We could evoke no response from her whatsoever nor from any of the people who were making themselves available for photo ops at the time. She was, however, very good at smiling for pictures at the same time she did not respond to the repeated asking of the question. We did see John Heyer, candidate for the 39th Council District (de Blasio’s seat), floating around the room with the rest of the people who had come in out of the rain. Mr. Heyer previously described his qualms about the project to us in great detail. 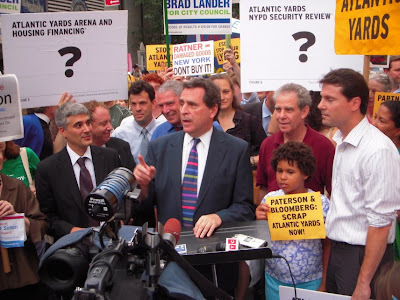 His qualms included objections to the public taxpayer funding of the arena, the project’s density and poor design, and the way in which the MTA was mismanaged and not serving the public in getting less than full value of the railyards from Ratner. This was before the project degenerated and the MTA piled on hundreds of millions more in Ratner giveaways. A week prior to this we chatted with Mr. Heyer at the informational meeting on Atlantic Yards where he expressed disgust at these new additional MTA giveaways. Mr. Heyer has more than one capacity in which he attends events these days: He is not just a candidate. He is also an assistant to Brooklyn Borough President Marty Markowitz. We didn’t find out exactly what Mr. Heyer might be doing next in the room. At that point, before the press conference began, we had to go back into the hearing room. We were told that our name had just been called for us to give testimony. During the break between the two hearing sessions we had a chance to meet Bertha Lewis for the very first time and that meant we got to put a question to her we had been dying to ask. Ms. Lewis seemed surprised that she was being asked this question (though it seems extremely obvious why it should be asked) and she indicated that she somehow didn’t understand the question that was being asked. We can be extremely patient and explained it to her. You have an agreement with Forest City Ratner, an MOU incorporated into the CBA. (She understood this.) It provides and specifies what affordable housing will be provided. (Ms. Lewis understood this too.) And it does so by setting forth in stratified bands, the various incomes of the families to whom that affordable housing will be provided. (Yes to this too.) And right in the middle there is a specified band of incomes of people, families who will not be having any of that the affordable housing provided to them. (Right now that band is families with incomes from $38,407.00 or 50% of AMI to $46,087 or 60% of AMI.) Ms. Lewis acknowledged understanding this AMI stuff. The missing (not provided for) band is right above the incomes for which the tax code would require that units be provided. We said this to Ms. Lewis. BL: I think you are just wrong- Here’s the deal. I don’t know how many affordable housing units that you’ve built, I don’t know if you’ve had to do affordable housing but that’s what we do. * And here’s what we did: Everybody whether from low to moderate to middle, everybody across the board shares in this. So I don’t know what your point is, I really don’t. BL: “I prevented a project from being totally luxury. So let me ask you, since you are looking at New York, I want you to tell me every other project that’s being built down here- you tell me about their bands, and then we can talk. OK? BL: No, I’m not. I’m providing for everyone, low, middle, and moderate. Ms. Lewis did not convincingly acknowledge or refute that she knew that there was a missing band not provided for in her agreement with the developer. Instead, she first told us first that we did not know what we were talking about and she then accused us of having a point that we wanted to make and said that we did not care if we lied or obstructed or what we did. We would have continued our conversation with Ms. Lewis further and she seemed energized enough to want to do so, except handlers (looking out for her welfare?) stepped in, interposing their bodies and telling us that the conversation was not to continue. One of them even suggested that we were harassing Ms. Lewis. Late in the evening a young man showed up to testify in favor of the project who might not have been there except for his connection to the Metrotech BID. . . There was, however, one thing that did initially seem surprising to us: The written questions submitted by those in attendance ran out about ten minutes before the meeting was officially scheduled to conclude. That was surprising to us until we thought more about the fact that some of our own Noticing New York questions that were submitted were not, in fact, presented. Other questions we submitted that were asked flashed by time-wise because they were not answered at all. In theory, questions we submitted might have been passed over if they duplicated other answered or evaded questions that were asked, but that was not the case. At least we will get to note them here. For the week preceding the hearing we found ourselves unenthusiastic about generating questions to submit at the meeting. It seems like shadow boxing since we are not being told exactly what the project now is. The timing on the release of information is all from the standpoint of accommodating the developer at the expense of the public. 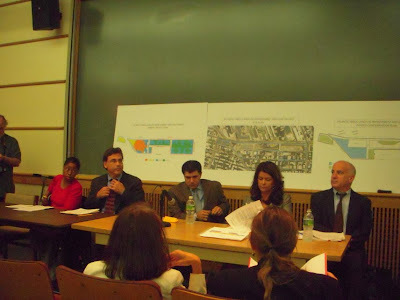 Although Ms. Gilmartin made a point that “It is approaching half a decade since Forest City embarked on the Atlantic Yards project” the crowd was being told that because Forest City Ratner is in the middle of designing the arena (the only fraction of the megadevelopment it currently plans to build, or maybe even design, near term) that the public won’t even be able to see images or know what is proposed until after next week’s public hearing on the project. Such images an information will not even be released until after the ESDC board approves the project on this sight-unseen basis. We managed to rev up our enthusiasm and did show up with questions. Then we generated more before the evening was out. Subtracting out the streets and the area devoted to green space, what’s the calculated Floor Area Ratio (FAR) and how does that compare to what would normally be legal for residential development? Will the project go back to the Public Authorities Control Board (PACB), the three-men-in-a-room who must review state capital projects? Matlin said no further approval is needed, given that the PACB approved the project, and the financing, in 2006." What assurance is there that ESDC will enforce its remedies against Forest City Ratner to complete the project and comply with the project plan given that whenever Forest City Ratner has requested ESDC has acquiesced and been willing been willing to eliminate and/or reduce those Forest City Ratner obligations from which Forest City Ratner has wished to be relieved? In this regard, having remedies that can only be enforced starting twenty-five years from now is representative of ESDC’s reluctance to saddle FCR with actual responsibilities. It is similar to the MTA saying that it will not immediately collect from Forest City Ratner the $80 million which FCR will theoretically, one day pay the MTA for its property. With the MTA at each opportunity rejiggering to give FCR a better deal (with less exacting obligations), why should anyone believe that the MTA when next asked won’t effectively excuse entirely payment of the $80 million it has deferred? In other words, the city won’t get benefit from what is built first so later on, without the kind of adequate enforcement from ESDC (which is definitely not assured), the city in not likely ever to get benefit, even by ESDC’s calculations. As No Land Grab snipes, ESDC only does a benefits-only analysis with no analysis of costs. What can you tell us about why Forest City Ratner as opposed to some other developer (for instance, a more credit worthy one or one that would pay the MTA more) should be the developer for the entire site? - In light of what you are willing to tell us in this respect to what extent are you willing to preclude the possibility or offer assurance that FRC will never assign any or all of the site to another developer at another time? - Given your answer to the forgoing why does it make sense that FCR is getting a long-term, low-cost option to develop the entire site with no corresponding obligation to go forward with that development? It should be noted that MTA’s and ESDC’s recent restructuring of the Forest City Ratner deal breaking the project into separate chucks or parcels, which FRC more clearly has freedom to proceed with or not, negates the idea that the megadevelopment must somehow be considered a one-developer deal. We restructured and resubmitted our question when ESDC Senior Counsel, Steve Matlin effectively answered part of our question after someone else asked, “Why Forest City Ratner and not another developer?” Mr. Matlin said there were two answers: 1.) Forest City Ratner had a contract with the Nets (pertinent to only a small portion of the project), and 2.) Forest City Ratner already had control over much of the site when it proposed the project. We also modified our resubmitted question to acknowledge that ESDC had already said that evening that FCR can assign away the project to other developers. No Affordable Housing for Those Who Most Obviously Need It? She didn’t offer any monthly rents. A 950 sf three-bedroom apartment at $30/sf would be $2375 a month--and a rather small three-bedroom apartment at that. Keep in mind that a not insignificant slice of the affordable housing would appear to track or exceed the market. Later, when the question came back up, she said that a rent of $12/sf on a thousand-foot apartment would be $12,000 a year, or $1000 a month. However, it's possible that no affordable units would be that large. 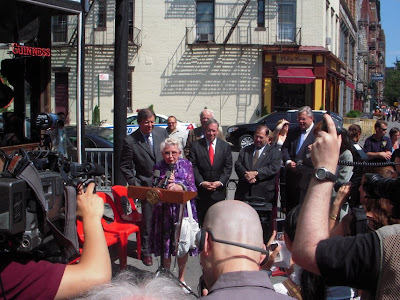 For more information on exactly how small affordable units would be, perhaps 575 square feet, not 1000, see: Saturday, July 15, 2006, AY snug or stingy? 575 sf for 1BR, 775 sf for 2BR. Why did FCR and ACORN negotiate a Community Benefit Agreement/Memorandum of Understanding that has an income band right in the middle where families most significantly in need would not be provided with any affordable housing? That band (families with incomes from $38,407.00 or 50% of AMI to $46,087 or 60% of AMI) is right above the income bands that the federal tax code will require will be in the project and right below the units that will be provided to higher-income, less-needy families at the rents that appear to track the market. Rather than say why this had been “negotiated” with ACORN, Ms. Gilmartin simply said that what was in the ACORN agreement would be adhered to. As Ms. Gilmartin did not answer the question we will provide the obvious answer. 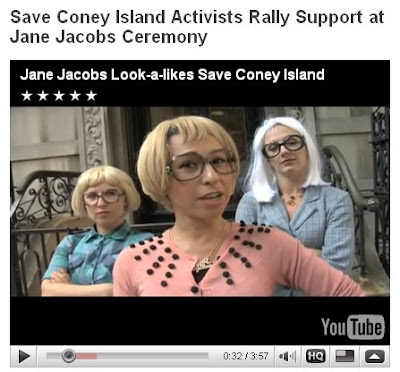 The concocted income bands minimize Forest City Ratner’s obligation to give any real public benefit. Since the bands below are required by the tax code anyway, they cost FCR nothing economically. To the extent that 575 square feet units at rents in the $1,535 to $2,880 monthly rent range track the market, there is also no economic concession to public benefit on Forest City Ratner’s part. Our chart has rent figures in it. Greene When It Comes To Numbers? Why did Forest City Ratner hire Darryl E. Greene to be responsible for tracking minority hiring and minority business enterprise numbers, when a little bit of research or Googling shows that Greene’s trouble with mangling numbers led to criminal charges to which he eventually pled guilty? This may be an unpleasant question to ask but one has to think about whose side Mr. Greene is on when it involves his taking home a check. Mr. Greene’s relationship to Ratner apparently goes back to at least 2004. 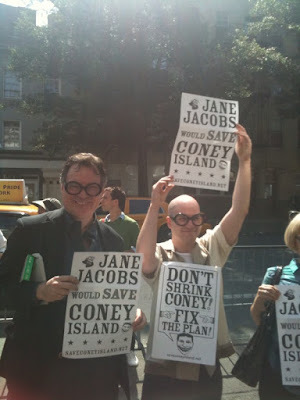 Unpleasant or not, we think that Forest City Ratner should have been given an opportunity to address this. Those then are questions we came up with. Once again, for a very full account of what happened go to the Atlantic Yards Report, being updated. While not all our question got asked or answered, we must note that the community board leaders had such a difficult job to do last night that it would be hard to fault any of them. One member in particular, Richard Bashner, chairman of CB 6, persisted with calm presence of mind to ask astute follow-up questions and bring far greater order to the proceedings than one would have anticipated given the willful disruptions (mostly by project supporters- click on video below) and the unfortunately provocative irritation of the perfunctorily rote evasions coming from Forest City Ratner ESDC.